On July 18, 2008, I bought an X-Treme XB-500 Electric Bike. 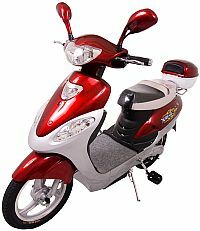 I bought it from Neo-Scooters, an internet distributor for X-Treme Bikes, and several other brands. The bike was delivered on July 25. My intention was to see if this was an effective way to live a more green lifestyle, and to fight the high prices of gasoline. At this point in time, (September 8, 2008) I feel safe in saying that at least for myself, the XB-500 is an effective alternative to my car in situations where I need to get around in a small town. I live about 1 mile from the restaurant where I have breakfast several times a week, and 2.2 miles from the nearest shopping center. I'm a part-time employee at a health club which is just over 10 miles from home. I have found that the bike affords suitable transportation to all of these places. The commute to and from work pushes the range of the XB-500 to the limit, but my boss allows me to charge the bike while at work, so I have not had to worry about running out of power on the way home. As for drawbacks, there is one minor one and three major ones. The minor one is that the speedometer is only accurate at 0 KPH. When you engage the throttle, the speedometer indicates about 30 percent higher speed than you are actually going. When you release the throttle, the indicated speed drops, but still indicates more than 10 percent higher speed than you are actually going. The three major drawbacks... The bike does not have enough power to climb even the slightest hill without slowing down, the pedals are completely useless, and the 20 mph maximum speed is not sufficient to keep up with traffic, even in the 25 mph zones. The laws in Michigan do not require pedals on a Moped, so I have left them off of my bike. Michigan also allows a Moped to have a maximum speed of 30 mph, so I began looking for ways to increase the top speed. I found a website called visforvoltage.org which has a blog about modifying the xb-500 controller to get more hill-climbing power. This modification really helps, and I have implemented it on my bike. I've also tried adding batteries, which increases the top speed a little. I have written up step-by-step instructions on how I have modified my bike. Use the links along the left side of this page to find out more.